I need a farrier… is there a farrier in the house? I have been thinking about the hippo sandal for months now and we have come up with a number of interesting theories. What we need to explain is what it was used for… We know that it was a piece of horse tack worn on the hoofs the key problem is that we also know that modern horses can not get on with them. A reconstruction for time team shows a very unhappy horse wobbling about on a set of hippo sandals looking uncomfortable. 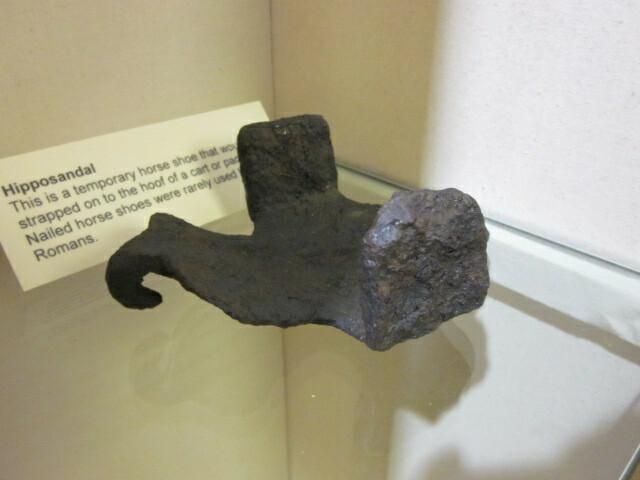 This blog has seen a number theories about the hippo sandal, was it a training shoe? was it a hobbling device? was it protection against caltrops? or was it merely an emergency horseshoe? Now one of the interesting things about the Hippo sandal is how rare it is given that the centrality of the horse in the ancient world, especially in war. It has always haunted me that an item that should be so ubiquitous should be such a rare find. We should see a lot more of them even if horse shoes are so hard to find after they have been thrown. So any explanation should account for this. Now my new idea is that the hippo sandal was not a horse shoe, not a tactical tool but rather an ancient example of one of the above mentioned “specialist shoes” designed to correct the pressure on the frog. So if any of you lovely readers is a farrier then please get in touch. Right so this is a running theme of the blog… what in the name of Jupiters divine posterior was this thing for. So far we have theorized that it was a hobbling device a training device to get horses to highstep but not quite dismissed the idea that it was a temporary horse shoe… well not all of us. The most exciting thing was talking to Amanda (thus avoiding having to actively participate in a little girls birthday party) and discovering that a similar design is currently being marketed and sold to equestrians (that means horsey people). So guess what I did today…I was in the museum looking at the artifacts. First I looked at the hippo sandal then the Caligae and then a caltrop. Then I looked back to the hippo sandal and then the caltrop then the sole of the Caligae. The Caligae are an important piece of kit for the ancient Roman soldier. They have thick soles reinforced with hobnails. 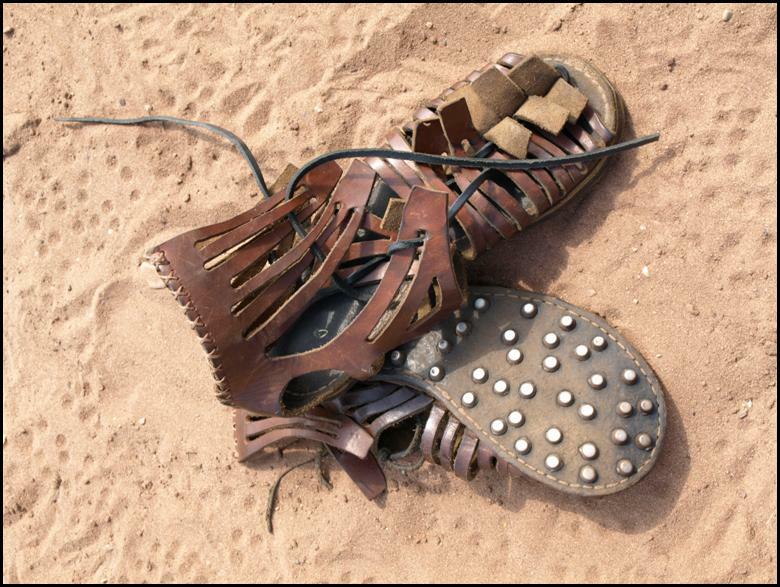 The Roman soldier had the best footware in the ancient world… maybe only rivaled by modern boots. These were boots that enabled him to march over difficult ground and protect his soles spikes, caltrops and sharp stones not to mention a terrible weapon that enable the legionary to stamp a downed enemy into jelly. But the caltrops held my attention. Caltrops, known to the Romans as a tribulus, are a area denial weapon sown onto a battlefield to cripple men, horses and extreme cases elephants (and in the modern age tanks). The enemy would stand on them and express their discontent in a loud manner before trying to get the thing out of their foot. A charge of foot men is impossible, horses are rended lame and elephants go bonkers but the last thing the Romans would want is for their own horses to be denied the same area. In fact a charge of light horse would change a faltering charge into a rout ,without the heavy infantry from even having to draw their gladius, in no time but they would need to protect their own horses frogs (the soft bit of the foot) from the caltrops. What caught my attention was the “sole” of the shoe which is completely covered. This iron base would be sufficient to squash any spike down allowing the horsemen to ride over caltrops with complete contempt… and of course anything else which was on the battlefield. Since I started this blog I have discovered a great deal of interest in the Hippo sandal from my readers. In fact posts discussing the hippo sandal are the ones which are most popular statistically and amongst my friends thinking up new and exciting uses for these strange artifacts has become one of our most common pub activities. At the end of last month I was shaken from my comfortable intellectual existence, where I think, dress as a Roman and shout at children and forced at wife point to my nieces birthday party. Which manifested itself as a pony party in a orchard. Surrounded by squealing children, fresh air and parents I discovered that this is not my natural environment. I got talking to the horse owner, Amanda Keech, and inevitably I brought up the Hippo sandal. She thoughtfully considered my description of the artifact, as a child bobbed along on a pony, and described a modern version that had recently come onto the market. As you can see this is a shoe that fits over the horses hoof and provides a cushion like a humans running shoe. Could this be the reason why ancient horses did not suffer from many of the endemic diseases that modern horses suffer from, like shin splints?